Long Beans is very commonly grown in south canara in late rainy season.It is one of the tasty vegetable used in different type of recipes mostly in coastal areas.The seeds of it also is used to make variety of curries. 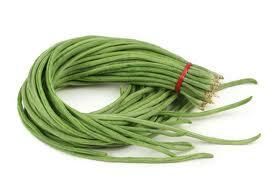 it is also commonly known as yard long beans or cowpea beans among many other names of it. Heat oil and add mustard seeds and cumin seeds. Once they start spluttering, add garlic and saute it. Add curry leaves and green chillies. Saute it. Now add onion and fry it till it turns golden brown. Add turmeric powder and beans. Add salt and some water. Cover and cook till done. Once the beans are cooked uncover it and let it cook on high flame so that the extra water evaporates. Take off the heat. Add grated coconut and lemon juice and give it a mix.